I was not making any bento yesterday because I couldn't sleep well on Sunday night. I slept around 2 AM and woke up around 5AM. 3 hours sleep really made me 'crazy' on Monday morning, so decided to just asked the kids to get lunch from the school catering. This morning I was really tempted for not making any bento but finally I made this quick Dear Daniel & Hello Kitty bento for the kids. I left the face parts on the kitchen table which I actually planned to decorate it after I took my camera from upstairs. The kids asked me whether they can decorate the parts of the face while I was preparing my camera. Because of the magic word 'please' then I let them to decorate the face for both Dear Daniel & Hello Kitty. Tadaaa ... this bento was our sweet collaboration ;) Inside the box : pan fried dori fish with Indonesian basic yellow spices, cherry tomatoes, and slices of cakwe (Chinese doughnut), and pea pods. Basic Yellow Spices is easy to made and can be stored in the refrigerator for 3 months. If you want to cook, take a little extra seasoning and add bay leaf, pandan leaf, or orange leaf. >> Blend all ingredients except sugar and oil for sauteing. >> Heat the oil for sauteing, stir-fry spices till fragrant. >> Add sugar, stir-fry briefly, remove and let cool. >> Put it in jars, ready for use. This bento looks great and the kids did a wonderful job. Thanks for the recipe for the Basic Yellow Spices. It sounds so good, but can it be used other than on fish. I am allergic to fish and can't go near anything to do with it. @backonthealex : Thanks a lot Kathryn for the sweet comment and for visiting my blog! The basic yellow spices can be used for marinating the chicken and pork too. You can fried/bake/pan fried/grill after the meats marinated for 1 hour. I usually make the chicken satay with this spices too :) Hope you can try it. beautiful bento lia -- you should be so proud of your creative kids! they did a wonderful job! and the yellow spices recipe looks AMAZING!! Looks gorgeous as always.. What is the pink flower made of? Aww they did a great job with the faces! What a nice and tasty collaboration! @Anncoo : Thanks a lot Anncoo! I love the way Daniel and Kitty holding the heart and the flower, they look so adorable! 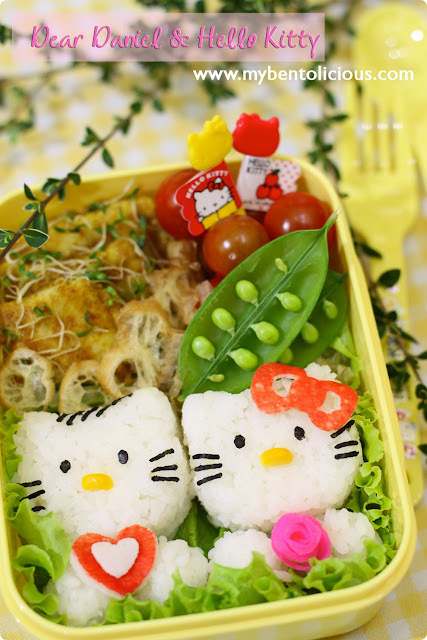 Beautiful hello kitty bento! It is super cute like always lia! Hope you're having a better week. Get some sleep! Wow, what a fun project for them to decorate their own bento... they're so lucky to have a mom with all the talent to provide the cute bento for them to help! I love those spice flavors too, making my mouth water just to read about them! It looks perfecto as always. This really is quite lovely. You are so talented! @Melanie : Thanks a lot Melanie! I also get crazy when I have only 3hours sleep haha. @noobcook : Thanks a lot for your kind words Wiffy! I want hello kitty. Im kinda missing my childhood.